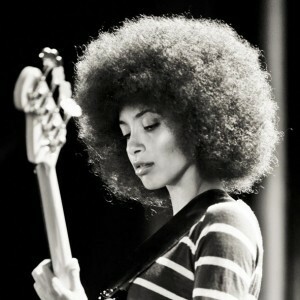 Esperanza Spalding is an American jazz bassist, singer and songwriter, known for her albums such as ‘Esperanza’, ‘Chamber Music Society’ and ‘Radio Music Society’. She has won four Grammy Awards, including the Grammy Award for Best New Artist at the 53rd Grammy Awards. Born Esperanza Emily Spalding on October 18, 1984 in Portland, Oregon, USA, her mother is Welsh, Hispanic, and Native American and her father is African-American. She was a musical prodigy, playing in the Chamber Music Society of Oregon since the age of five. She released her debut album Junjo in April 2006 by Ayva Music. She was homeschooled for much of her childhood. *She was born on October 18, 1984 in Portland, Oregon, USA. *Esperanza and her brother were raised by a single mother. *First jazz artist to win a Grammy Award for Best New Artist. *Her album Radio Music Society sold over 114,000 copies in the United States. *She has cited Ella Fitzgerald as her musical inspiration.